MANILA, Philippines – President Duterte yesterday ordered his officials to complete the distribution of shelters to families hit by Super Typhoon Yolanda by yearend as he is not satisfied with the help given to typhoon victims. Duterte lamented that only a few people are staying in the bunk houses provided by the government three years after the typhoon ravaged the country. “I am not satisfied. As a matter of fact, it’s BS (b***s***) to me,” Duterte said during the commemoration of the third anniversary of Yolanda in Tacloban City. “I’ll be back here in December. I want all of them transferred to the bunk houses by December,” he added. Duterte directed presidential assistant for the Visayas Michael Dino and Vice President and Housing and Urban Development Coordinating Council (HUDCC) chair Leni Robredo to oversee the distribution of the shelters. “You know, I rarely shoot people, especially my friends. If you fail to do that…” Duterte told Dino in jest. “In the fullness of God’s time, I will be back in December. If they are not transferred (to the shelters), get some land from Bonifacio or Forbes Park,” he added. Duterte refused to blame the previous administration for the issues hounding the relief delivery and even apologized to the people of Tacloban for the government’s shortcomings. “If these houses are not yet completed next month, just transform them into a crematorium. What am I supposed to say here? 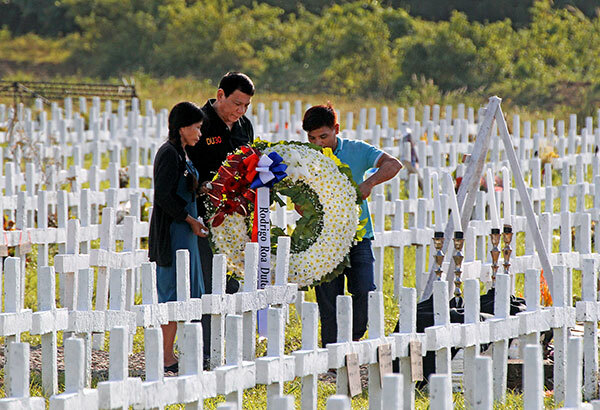 Three years has passed and you are just waiting for another typhoon,” Duterte said. “We hope no one is here when that time comes so we do not have to say ‘I am sorry it has gone to this.’ Really, I am apologizing to you,” he added. While saying that his statements were not meant to offend anybody, Duterte could not hide his displeasure with the red tape and inefficient delivery of government services. “You know, we are so underdeveloped (as) a country. That by the nature of the listeners and indolence of some idiots, we become double the underdeveloped, whatever that phrase means,” he said. Robredo yesterday apologized to the Yolanda survivors in Tanauan, Leyte for the delay in the government’s construction of permanent shelters. Robredo said around 205,000 houses are needed for Yolanda victims, who remain in makeshift houses without power and water. “First, I would like to apologize for the delay. There are many houses which are not yet constructed. So far, we only have relocated about 5,000 families,” Robredo said during the commemoration of Yolanda’s third anniversary yesterday. Robredo has vowed to fast-track the building of permanent shelters in affected areas. She said housing agencies under HUDCC have agreed to streamline the processes in constructing socialized housing. Meanwhile, the Department of the Interior and Local Government (DILG) said it has completed more than half of the approved projects in relation to rehabilitation of areas affected by Yolanda. Based on data released by DILG, 2,759 out of the 4,474 rehabilitation projects are completed. The projects are part of the Recovery Assistance on Yolanda (RAY) program, which is being implemented in three batches. The RAY program provides support and assistance to local government units most affected by Yolanda, including the provinces of Palawan, Masbate, Aklan, Antique, Capiz, Iloilo, Negros Occidental, Cebu, Biliran, Eastern Samar, Leyte and Samar. By breakdown, 305 out of 308 projects in the first batch are completed. These involved the repair of provincial/city/municipal halls, public markets and civic centers, mostly in Eastern Visayas. In the second batch, 2,458 out of 3,551 projects are completed. These involve the rehabilitation of totally and partially damaged barangay facilities such as barangay halls, barangay day care centers, barangay civic centers and the seven additional municipal facilities which were not funded under the first batch. But only six out of 615 projects in the third batch have been finished. DILG said these cover the rehabilitation and reconstruction of water supply systems, drainage systems, transport terminals and halls of justice in Yolanda-hit provinces, as well as municipal and barangay facilities not funded under the first and second batches. “Three years after Yolanda, we have become more vigilant, more responsible and more resilient as a people and as a nation,” said DILG Secretary Ismael Sueno. On his message for the commemoration of Yolanda, the interior secretary stressed the importance of preparation in case of disasters. “On the third year (since Yolanda), we hope that our local government units and other frontline agencies will take Yolanda’s lessons to heart to ensure that zero casualty scenarios will not remain a vision but a reality,” Sueno said. “Let us imbibe the culture of preparedness and make it a way of life so that we can continue our journey to becoming a nation where every citizen leads a safe, happy and comfortable life,” he added. Sen. Joseph Victor Ejercito, on the other hand, proposed the creation of a new task force that will lead the rehabilitation of areas devastated by Yolanda. Ejercito, chairman of the Senate committee on urban development, housing and resettlement, said it is not enough to have the National Economic and Development Authority at the helm of the rehabilitation and recovery program.